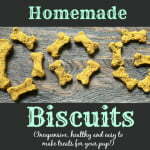 These easy to make dog biscuits are very inexpensive and healthy for your little pup. Steam your sweet potatoes, kale, apple and zucchini so they are nice and soft. I put mine in the microwave for about 5 minutes and they were all tender. In a food processor, grind your oats into a powder. Add all the other ingredients (potatoes, kale, apple, zucchini, backing powder and greek yogurt). Combine until a dough forms. Roll out your dough on a piece of parchment paper. The dough was kind of hard to work with because it's very sticky. I just kept pressing it down until it was thin enough to make the biscuit. I then used the cookie cutter and moved the bones to a cookie sheet that was sprayed with cooking spray. Cook for 10-20 minutes depending how you like them. You will need to keep these refrigerated so they may not stay crisp.I kept mine a bit chewy but I think if you want the crispier you can bake them longer or turn off the oven and let them sit in there until it cools down.